Long gone are the days when parents were cautioned against raising their children multilingually as it was believed to hinder academic and intellectual development. Quite the opposite: talk of the cognitive benefits of speaking multiple languages – often referred to as the “bilingual advantage” – is currently in fashion. Headlines such as Bilingual babies benefit from learning faster or Bilingual children show advantage in noisy classrooms are difficult to skip for a multilingual parent with a baby at home. Yet, while you read one article that explains Why Bilinguals are Smarter, the next article questions: Are Bilinguals Really Smarter? How is one supposed to make sense of all this conflicting information? Having spent almost a decade of my life doing social science research of one kind or another, I know that the information you read in news headlines does not always correspond to that what can be read in the research report those headlines are based on. So I decided to dig a little deeper by looking into the current academic literature on the cognitive effects of bilingualism, focusing specifically on studies about babies and young children. How are the studies done? Before we talk about studies and their results, there is one thing that needs to be clarified first: how exactly are scientists coming to the conclusions that they present and that the mass media so eagerly gobbles up? The majority of studies about the impact that speaking multiple languages has on our brains are experiments with two groups of participants: one group is bi- or multilingual, the other – the control group – is monolingual. This basic setup is sometimes mixed up by taking two or more groups of bilinguals that differ, e.g., by the languages they speak, their ethnic, or migration background. It is highly important that the groups are as similar as possible in every other potentially important characteristic aside from the languages a child speaks. Typical characteristics that are controlled for are as diverse as the socio-economic background of the families and the memory abilities of the child. Furthermore, the test tasks need to account for the fact that multilingual young children may have lower verbal skills, i.e., they may lack the vocabulary in the country’s majority language if compared to their monolingual peers. Early studies on bilingualism often failed to take these two very important aspects into account and, as a consequence, lead to the long-held assumptions that bilingualism is harmful for children’s development. 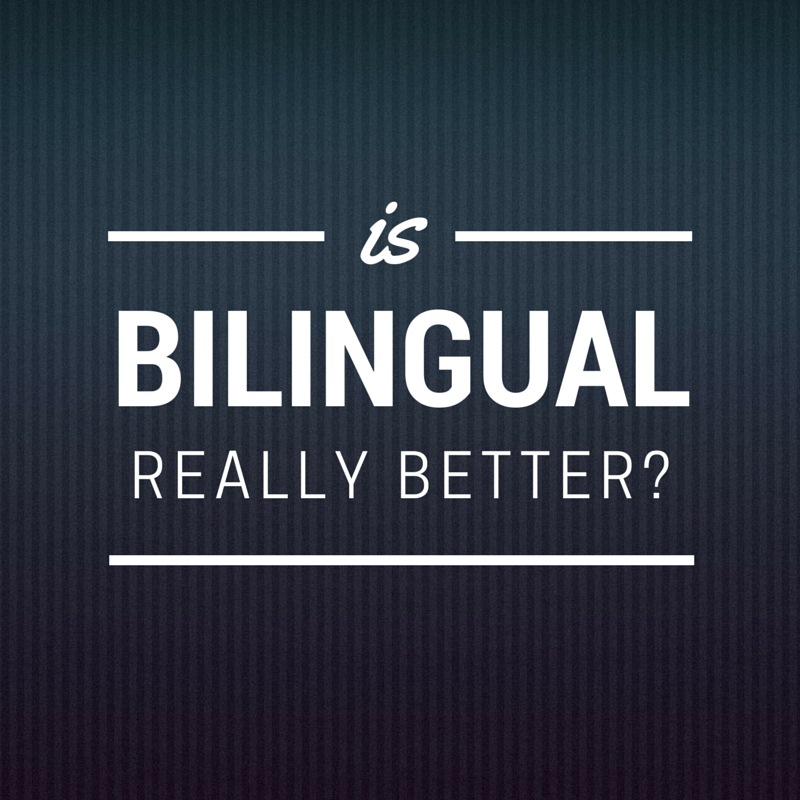 How exactly are the effects of bilingualism measured in these studies? Several recent research projects have begun exploring the uses of such fancy equipment as MRI machines, but most studies continue to rely on a variety of tests or tasks that the participants need to take a part in. Of course, one cannot really make a six month old baby do a task, can they? Studies on babies typically use eye-tracking techniques and measure what the babies look at and for how long. Images provided vary from an array of dots on a piece of paper to animal photos. Older children are usually asked to do a verbal or a non-verbal task. The specific assignment varies based on what the study is attempting to measure, but let me give you a couple of examples. A verbal task could be, e.g., matching words with pictures and noticing erroneous pairings of words and images. One of the most common non-verbal tasks is giving the children a set of cards with red and blue circles and squares and asking to sort them. First the child is asked to play the “color game” and sort the cards by color, immediately followed by the “shape game”, i.e., sorting the cards by shape. The first studies about the effects of bilingualism that focused specifically on children were interested in two topics. The first was whether speaking multiple languages has an impact on intelligence, measured by IQ tests. The second was whether it impacts school achievement, measured by literacy and math capabilities. If done correctly, i.e., by carefully matching the groups and including also non-verbal tasks, the majority of studies find no significant difference between monolinguals and bilinguals with regards to IQ and school performance. If bilingual children are not smarter based on these traditional ways of measuring intelligence, what is the foundation of all the talk about “bilingual advantage” then? In the last couple of decades the scientists have pinpointed two other areas of inquiry where bi- and multilingual kids show some cognitive advantages over monolingual children. These are executive control and metalinguistic awareness. The term “executive control” describes the ability to solve problems whose solutions depend on selective attention or inhibitory control. It actually comprises several skills: (1) the ability to stay focused despite distractions, (2) the ability to willfully switch between tasks, and (3) the ability to hold information in mind while performing another task. Executive control is currently the most researched topic in the field and studies show some truly interesting results. It appears that bi- and multilingual children have an upper hand in solving tasks that require attention and inhibitory control. In other words, bilingual kids are better at deliberately focusing on tasks, tuning out distractions, as well as switching between various assignments. Differences in these abilities have been observed already between bilingual and monolingual 7-month-olds. The term “metalinguistic awareness” means the capacity to analyze different aspects of language, e.g., words or syntax. A typical example would be judging whether the sentence “apples grow on noses” is grammatically accurate despite having a completely incorrect meaning. If recent studies in this field are compared, the combined results are fairly inconclusive. It is possible that bilingual kids show better metalinguistic abilities only in tasks that also require selective attention or inhibitory control – the attributes of executive control described above. Namely, compared to their monolingual peers, bilingual children may be better at ignoring irrelevant information and thus have less difficulty to solve the various linguistic assignments. Despite an abundance of studies that show some cognitive benefits of speaking more than one language already in the first years of life, everything may not be as simple as it appears. You see, in the jungle that is academic publishing it is much much easier to get your study published in a prominent journal if it has shown positive results. If your results are inconclusive or even negative, bad luck. A brand new study by scientists from the University of Edinburgh inquired whether studies on bilingualism and executive control presented at conferences between 1999 and 2012 eventually got published in academic journals. They discovered that studies that supported the bilingual advantage were considerably more likely to make it than studies that showed mixed results or found no advantages related to language. These findings should serve as a reminder that there is still a lot to find out about the potential positive (or negative) effects that speaking more than one language can have on our brains. That said, there is little to none meaningful evidence of bilingualism being bad for the brain. Likely, being exposed to multiple languages from an early age wires the brain neither better nor worse but simply differently. What does all of this mean for the families who raise their children using more than one language in their day-to-day life? The ability to better focus in a noisy classroom, or to easier grasp the structure of a foreign tongue, are very nice side effects of bilingualism from birth but for most families they are not the main reasons for using multiple languages. There are other considerations that are much more important: the children’s ease of communicating with their extend families, the ability to pass on one’s cultural heritage, the provision of language skills potentially useful for future employment, and many other reasons that are as unique as each separate family. Thus, while the scientists continue to debate about the areas and extent of bilingual cognitive advantages, I am certain that there will be more and more families deciding to raise their children multilingually. Thanks for taking the time to write and then post this. I’ve shared it with some like-minded folks in the USA. Keep up the fight to make a multilingual world! What an informative and thought-provoking post; Ilze! Thanks for sharing your review and your own thoughts. I will be reading the articles you shared and would be grateful for any related references.